April has been an odd month for weather. Some days, such as those we’re experiencing at present, make leaving the house a less than appealing prospect. However, not long ago we had about 8-10 days of blissful sunshine and the warmest April temperates on record in this country. It brought about the return of the T-shirt and shorts combo, wildlife that we haven’t seen in several months and that ever-appertizing smell of a BBQ from a number of neighbouring gardens. The good weather also got plenty of us thinking about sprucing up our gardens again. Lawnmowers were back in business, and spring flowers were no doubt being planted in their thousands. Here at Floor Coverings Essex, we have seen a substantial rise in popularity of artificial grass over recent years. With clever innovation helping to give this once niche product a much more realistic look and genuine practicality, the market for imitative turf is bigger than ever. Many of us know the struggle of maintaining a tidy and healthy green lawn. When the hot weather sets in for the longterm, patches gradually appear and the garden can begin to resemble dust land. Conversely, in the colder, wetter months, our gardens can become completely unusable due to boggy, muddy turf. With artificial grass, this is never a concern. Available in a number of thicknesses and looks, the turf maintains a fresh green, pleasing appearance for good. No more mowing, no more weeds, no need for the sprinkler! 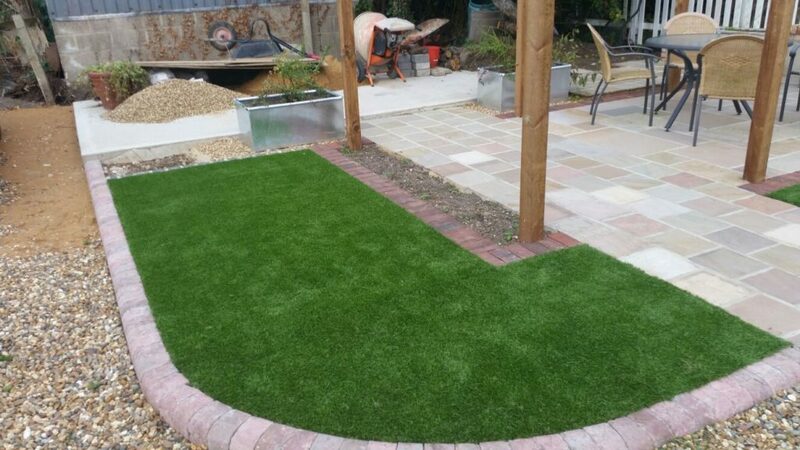 One question we’re frequently asked about is whether artificial grass is suitable for pets. The answer is yes! Being a permeable product, urine or any other liquids drain through and other deposits from your pets can be easily removed. It is easy to keep the lawns clean, particularly the shorter pile versions – just spray down with a hose (occasionally, you may want to use a purpose-made cleaning agent to guarantee yourself a germ-free area). And no more muddy paws! 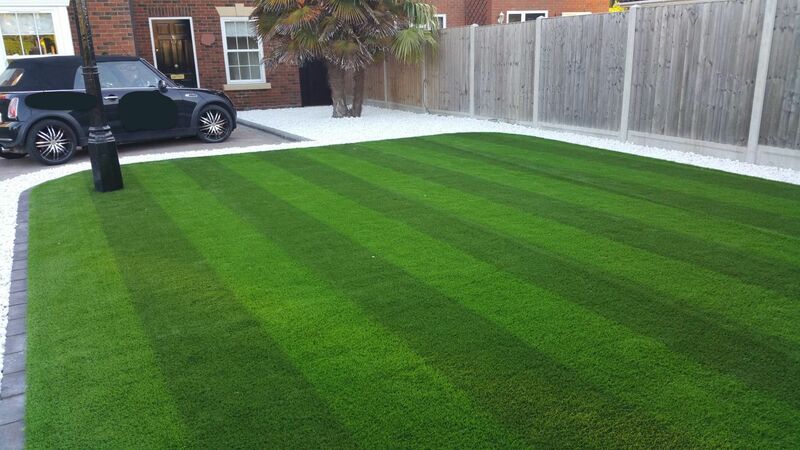 We have lots of artificial grass options available at Floor Coverings Essex, including a striped effect, a huge variety of pile lengths and every width available on the market – even 5m! We use trusted fitters, who will personally come out to your home to estimate and survey your garden so that the job can be completed properly and professionally. Furthermore, we have grass off cuts at great prices, should you be looking to cover a smaller area, such as in the photo above. Here’s hoping for warmer, dryer weather throughout May! If you’re interested in artificial grass and would like to find out more, feel free to give us a call or pop in to one of our showrooms where we can show you samples of all the options.